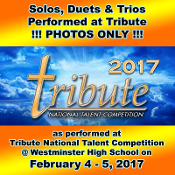 Veria Video In Association With Colorado School of Dance in Parker, CO presents Solo, Duet & Trio dances performed at Tribute National Talent Competition as performed on Saturday & Sunday at Westminster High School on February 4-5, 2017. THIS PRODUCT IS PHOTOS ONLY! You will receive ALL photos captured for your dance(s) in high resolution. Please indicate which dance(s) you would like photos for in the comments / notes section when checking out. All photos will be delivered online via our SmugMug website.